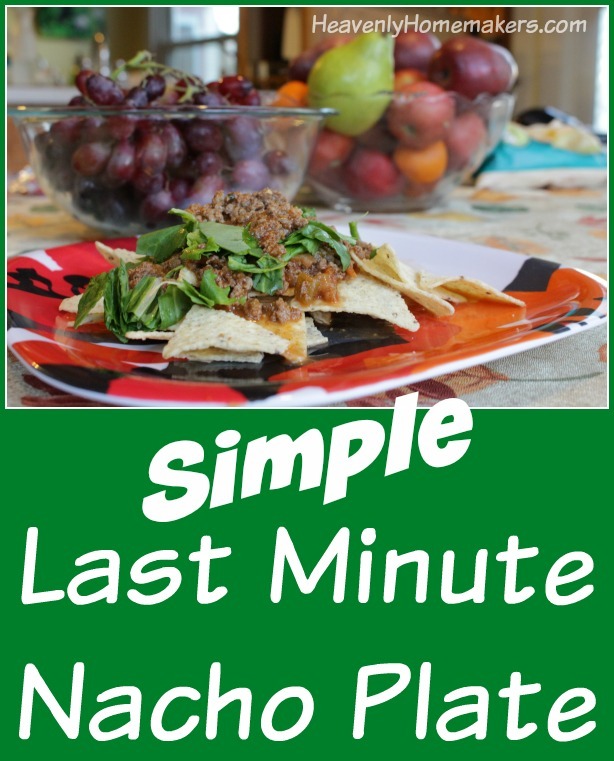 This Simple Last-Minute Nacho Plate comes together very quickly and is a huge crowd-pleaser at my house! It’s almost embarrassing the amount of salsa we have been going through lately. Though I suppose our family goes through an embarrassing amount of pretty much everything, so never mind. I was at Aldi a few weeks ago and put two cases of their organic salsa in my cart. Why get 1 jar when you can get 24, right? While in the check-out line, the lady behind me asked, “Oh! Did I miss a sale on salsa?” Nope. It’s a “we eat massive amounts of food at our house because of all the teenage boys” situation. That and I don’t live close to an Aldi and don’t get to shop there very often. The great thing about any of the recipes I share that involve salsa is that you can use your favorite brand and your preferred mild-to-hot level. With all these recipes being so tasty and easy, it any wonder that I bought 24 jars of salsa at once? This newest recipe idea, Simple Last-Minute Nacho Plate, is the result of what happened when I made a big batch of Meat and Cheese Burritos and had leftover filling. I didn’t have time (or desire) to make more tortillas, so I put the leftover meat/cheese/salsa mixture in the fridge. The next day we warmed up the mixture for lunch. We threw the delicious meaty goodness on top of tortilla chips with a few greens and whatever other toppings (olives, tomatoes, etc) that each person wanted. It was then that I said to myself, “Why have I not done this before?” And a new Simple Recipe was born. Now, take note that while this is called a “Last-Minute” recipe, you most certainly do not have to wait until the last minute to make it. Sure, it’s a recipe that can save your neck if you didn’t plan ahead and you need a meal on the fly. But the meat mixture stays good in the fridge for several days so you can make it ahead of time and pull it out to warm up as needed. It also freezes well, so you can make a double or triple batch and freeze it in meal-sized portions for your family to thaw and re-heat on busy days. Brown hamburger meat until it is no longer pink. Stir in salsa and cheese. 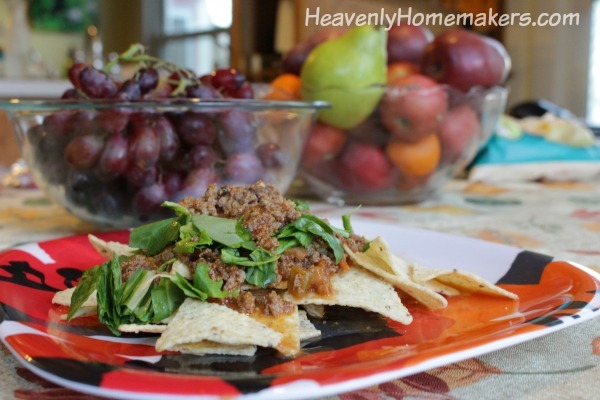 Serve on a plate of tortilla chips with your favorite nacho fixin's. Here’s what Michelle said about Simple Meals: YAY. I love it. I am very thankful you are doing the “work” part of meals for me. Question: How much do you love salsa at your house? My mom began making salsa when I was a little girl, tweaking and playing with ingredients from her garden until she figured out a recipe that was just right. We all loved it. Neighbors loved it. Family members loved it. Friends loved it. There was nothing incredibly fancy about Mom’s salsa. It was slightly sweet. Slightly spicy. Just right. When my brother and I were in college, she would send her home-canned salsa to the dorm with us. It became a hit with our college friends and it wouldn’t last long. :) I’m not sure when Mom’s salsa really began to become a “big thing” locally, but I believe it was around the time I was graduating from college and getting married. Now my mom didn’t have to break her neck to keep up with the salsa demand! It was being made and shipped out to stores and marketed by others. My mom was so pleased with this success, and well she should be. She’d worked hard for this! My mom was diagnosed with ALS (Lou Gehrigs Disease) in the fall of 2002. Salsa sales had begun to slow by then anyway, and all of us were so focused on Mom and her health and keeping her comfortable, salsa was really the last thing on our minds. 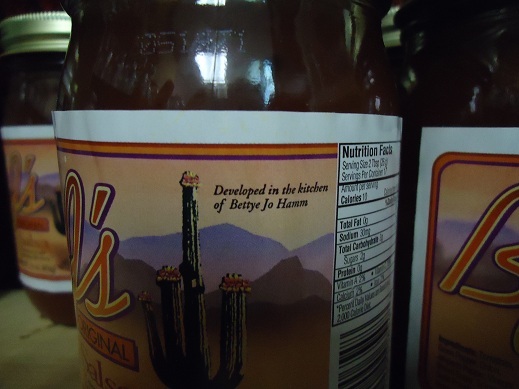 After she went to be with Jesus in July of 2004, our family was so thankful to have a few jars of her salsa left. We cherished and hoarded them. We were out of sorts and grieving. We weren’t thinking very logically (or at least I wasn’t), which is why it took over a year for us to talk about or realize that it may still be possible for her salsa to be made and sent to us. Dad checked into it and sure enough. 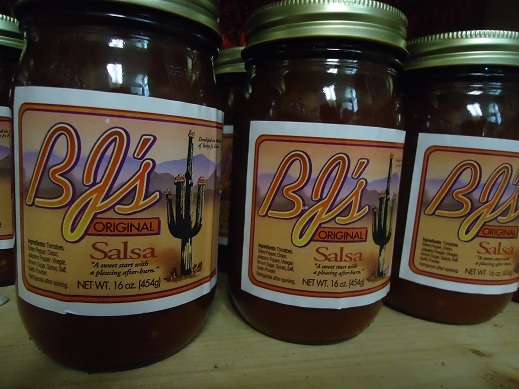 We could get ourselves some BJ’s Salsa. It helps me not miss her quite so much. Or maybe it makes me miss her even more. Now, anytime I talk about using salsa in a recipe, you know that I’m not just using any ol’ salsa. I’m opening a treasure each time I open a jar of salsa. One that came right out of “Bettye Jo’s kitchen”. I am writing this Gratituesday post as a reminder to myself to be grateful for Pete’s sake. You know why? Because lately I have been a whiny baby who has been feeling very sorry for herself. I’ve been whining because I have tomatoes and peppers needing to be picked at a crazy fast pace. I can hardly keep up with making them all into tomato sauce and salsa. They are constantly covering my counter-tops. Also, my friend gave me a huge bunch grapes that I need to hurry and do something with. And I have two sacks of apples that I keep tripping over that really should be made into applesauce. And there are more apples to be picked if I could ever get around to going to pick them. My kitchen is exploding with abundance…and I am whining. I’m whining because I have too much food. Really Laura? I’m whining because I have so much work to do, really? It’s time for me to stop whining and be grateful. Thank you for letting me confess my rotten attitude and for holding me accountable to changing it. God is good and if I can’t remember that…perhaps I should just take a good look around my kitchen at all the abundance. Because of Him, my family will not go hungry. Nope, in fact…we’ll be eating like kings. 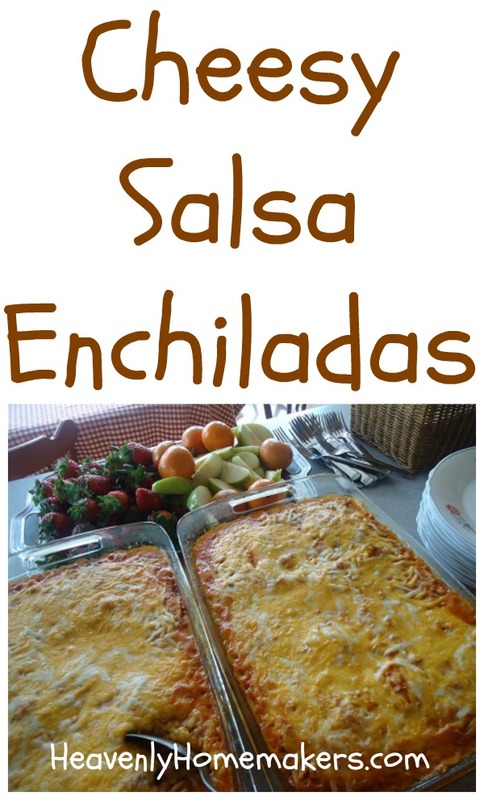 Layered Cheesy Salsa Enchiladas are about to become one of your family’s favorite recipes! This recipe can not get any easier! Typically, I have all the ingredients on hand for these Layered Cheesy Salsa Enchiladas. So that means I can throw this together at the last minute whenever we need it. Everyone in my family loves this, which is a huge score! We prefer flour tortillas, but these enchiladas can also be made with corn tortillas if you have a gluten intolerance or if you just like corn tortillas better. Brown meat. Stir in salsa and ½ cup of cheese. Lay 4 tortillas in the bottom of a 9x13 inch baking dish. Spread half of meat mixture over tortillas. Layer again with the 4 remaining tortillas. Spread remaining meat mixture over tortillas. Top with 1½ cups cheese. Bake uncovered at 350° for 20-25 minutes. This dish freezes easily too, making it a great make ahead meal! Freezing Instructions: Cover dish well and freeze. Thaw and bake as directed above. Or, if the enchiladas are frozen, bake in a 250° oven for one hour, then at 350° for another 30 minutes or until cheese is bubbly. 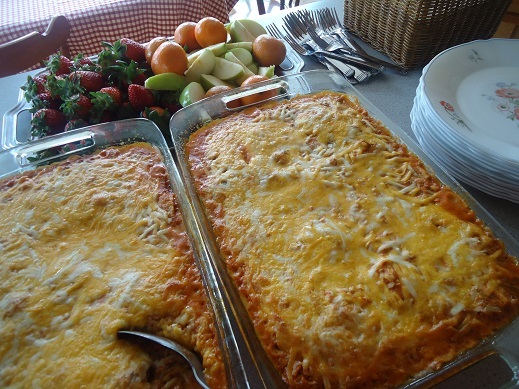 Serve these Cheesy Salsa Enchiladas with a tossed salad and fresh fruit. This meal is as simple as can be! 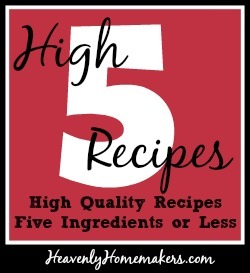 I have several more High Five Recipes up my sleeve (not literally of course, but wouldn’t that be fun to see?). Oh, and actually if you haven’t already, you should go read the story of my sleeves because, well it’s always fun to read about sleeves.